Kylee is from Brawley, California, a small farming community in the furthest southeast corner of the state. Her connection to the land was established early in her childhood when her favorite pastime was doing field checks with her dad and “sampling” produce before harvest. Since high school, Kylee has lived all over California but has most recently moved back to the central coast after three years spent in Alaska. 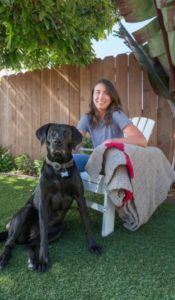 Kylee has a degree in Environmental Science from Humboldt State University (HSU) and her Masters in Public Policy (MPP ’13) from Cal Poly. In 2016, Kylee and her husband Nick were lucky enough to move back to SLO County so she could take the role as Cal Poly’s first Sustainability Coordinator. Throughout school and before her job at Cal Poly she worked with a variety of environmental non-profits including ECOSLO here locally. While she feels blessed to have established a career in sustainability, specifically as it relates to the university’s resource management, her passion has always been in sustainable food systems. Her role on the Glean SLO steering committee is one fun way to continue working toward a more socially and environmentally just food web. When she is not working or gleaning, you can find her and her husband working on their house, on an adventure in the great outdoors, or growing, cooking, and preserving local bounty. She loves sharing her foodie skills and the fruits of her labor with her friends, family, and community. This entry was posted in Uncategorized on 07/07/2017 by gleanslo.